Duke Energy Carolinas/Progress has rolled out some new programs that benefit homeowners, farms, businesses, and nonprofits who are installing solar systems this year. This recording of our February 2018 webinar helps explain the new programs, mainly the rebate program that can take ~25% off the cost of the system. That rebate can be taken in addition to the other incentives/grants still available for solar. Additional resources (weblinks, calculators, installer lists, guides) are posted below the video. Something that we didn't make clear in the recording: the rebate program is open to the first ~1,000 homes and ~200-300 farms/businesses/nonprofits who apply in 2018. The program will repeat each year through 2022, with similar 'caps' each year, as far as we now know. Reduce your Energy Usage: Get rebates worth up to 80% for insulation, HVAC, duct sealing, and more through Duke's Smart Saver Program for energy efficiency improvements. An energy professional will come to your house for free to tell what your home needs. Using less energy means that the solar system you build can be smaller. And these measures often pay for themselves much faster than solar systems, especially with Duke paying for the lion's share up front. Connect with Installers: Visit our Installers Page for a list of area solar installers and tools to help your site visit with them be productive. We recommend getting quotes from two or three different installers. Feel free to call us (828-649-5115) if you would like more guidance. Apply for the Duke Rebate: When you have chosen your installer, they should help you get your application in to Duke so you'll be first in line for the year's rebate. Visit Duke's Rebate Page for more details/news. Wait for Approval from Duke: You can wait on signing your installer contract until Duke has confirmed that you will receive the rebate. Sign Your Installer Contract: and submit your deposit. Construction Begins: The installer will finish the design and construction, help you apply for interconnection with Duke, and finish the inspections. Collect Your Incentives: With your final paid invoice in hand, you will be able to claim your Duke Rebate as well as the 30% Federal Tax Credit. First, Reduce your Energy Usage: Get rebates worth up to 80% for insulation, HVAC, lighting, refrigeration, duct sealing, and more through Duke's Small Business Energy Saver Program for energy efficiency improvements (They also have a "custom program" worth looking into). An energy professional will come to your business for free to do an assessment and prioritize cost-saving measures. Using less energy means that the solar system you build can be smaller. And these measures often pay for themselves much faster than solar systems, especially with Duke paying for the lion's share up front. Duke Rebate Program - Your installer should help you with this. USDA-REAP Grant - For farms and rural small businesses. WNC energyCAP can help you with this. Click the link for program details. 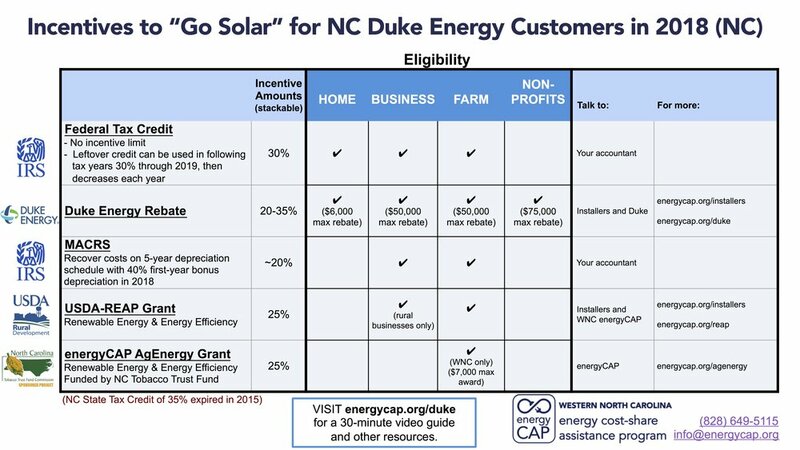 WNC energyCAP AgEnergy Grant - For WNC farms only. WNC energyCAP can help you with this. Click the link for program details. Collect Your Incentives: With your final paid invoice in hand, you will be able to claim your Duke Rebate, grant award(s), as well as the 30% Federal Tax Credit and MACRS Accelerated Depreciation benefit.